Our Single Grain trio evening continued with Strathclyde single grain from Glasgow. Originally built in 1927 on the site of an old cotton mill to produce gin, it has gone on to pump out grain spirit, primarily for blends for its current owner – Chivas Bothers Holdings, part of the Pernod Ricard group. Nose – Unmistakable varnish – full-on, then caramel, banana, light flowers, then nuts like walnut, coconut, dried fruits, shifted into a creamy aroma – like sweet coconut cream, becoming increasingly sweet like butterscotch – loads and loads of butterscotch, then baked banana bread, roasted almonds, a bit of chocolate, then just as earlier it was unquestionably butterscotch, it was sawdust or fresh wood shavings, after airing even more like marshmallows! Water – Don’t. Loses the nose which is by far the best aspect. However it did bring out the most compelling nescafé instant coffee taste! The nose was the most interesting element of this grain whisky. It was remarkable how it kept evolving – all elements nuanced yet distinctive. Whereas on the palate, it was came across as innocuous, something to accompany with little remarkable on its own. And yet, as we re-calibrated ourselves to grain, there was no doubt this was the clear favourite of the three single grains sampled! Nose: Milk chocolate, thyme honey and a pinch of spicy clove. Palate: Cardamom and cinnamon up front, followed by waves of caramel and brown sugar. Finish: Minty, with heaps of chocolate-fudge brownie later on. 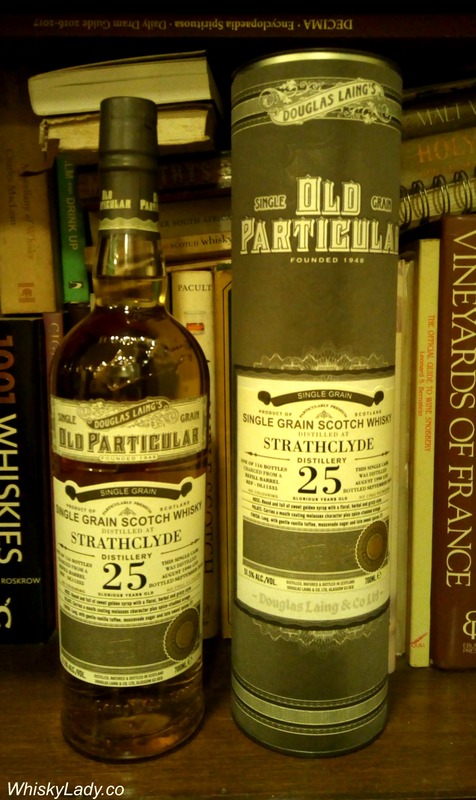 While I can’t say where this particular bottle was purchased, it is available through Master of Malt for $82. We sampled it on 31 August 2017 from a closed bottle. This entry was posted in Grain, Lowlands, Scotland and tagged Grain, Strathclyde, Strathclyde 25 year by Carissa Hickling. Bookmark the permalink.